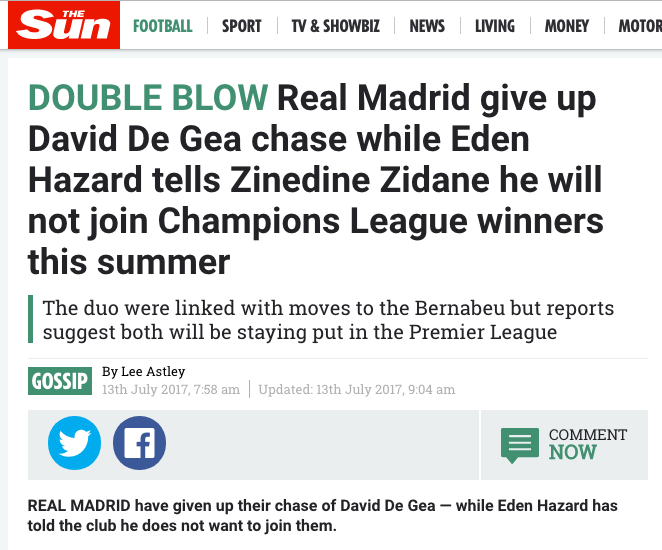 Transfer balls – a look at rubbish football reporting: The BBC says Manchester United goalkeeper David de Gea, 26, wants to join Real Madrid this summer. The David de Gea option is still very much alive. The current United goalkeeper is not willing to let the Real Madrid train pass for the umpteenth time and press in the offices of the Santiago Bernabéu through his agent, Jorge Mendes. De Gea is still the right eye of Real Madrid president Florentino Perez, who is waiting for a final PSG move to remove Keylor Navas from Madrid and be able to open the door of Real to Spanish. This all seems to suggest that De Gea’s agent is agitating for his client’s move. And Perez doesn’t sound “desperate”. Whatever the source, the report offers no quote from player, club nor agent. We do hear only from one Pipi Estrada, a journalist for Spanish sports TV show El Chiringuito. And that’s a dead end. Spanish transfer outlet Don Balon claim Madrid will try again this summer, with club president Florentino Perez desperate to land the Spanish international. De Gea, meanwhile, is said to have told his agent Jorge Mendes to get the deal sorted. Agent Jorge Mendes could seal the deal with Real Madrid. Real Madrid, however, has already perfectly located a new candidate to become the starting goalkeeper next season. And at a much more affordable price than De Gea: Kepa Arrizabalaga. Such are the facts in the twilight world of football reporting.